What will Smart Metering look like in the UK? This week, the UK government published their response to the consultation that ran over the summer. Basically, they asked how smart metering should be implemented in the UK, offered some proposals, and invited anyone to tell them what they think. In case I hadn’t already convinced people that I was a geek, I read through the Government response paper. It basically reiterates the proposals that were outlined before the summer, summarises the responses that they received, and states the decisions that they have reached as a result. Is it really very geeky that I found this interesting? In case you missed all the press about this in the past week, the plan is still that we’re all getting smart meters, and it’ll happen in the next ten years. “I Want a Referendum” is holding a referendum in ten Labour and Lib Dem constituencies in the UK. It’s even made the news, and Eastleigh – where I live – is one of the constituencies involved. You get two questions – which essentially boil down to “do you think there should be a referendum?” and “if there was, how would you vote?”. And a litle “Information Booklet” that explains the two sides of the argument – the argument against the Lisbon Treaty written by “I Want a Referendum”, and an argument for it from the European Movement. I found this booklet very interesting. I mentioned a couple of weeks ago that I was impressed with the response I got to my ranty email about one of the more annoying local traditions – having your car wing mirrors broken off on a Friday night. A quick update – I was surprised to get a posh looking letter on House of Commons headed paper today. It was a letter from my MP enclosing copies of letters written to the Chief Executive of my local council and the Chief Inspector of the local police, and promising to let me know when he gets replies. Eek. People really shouldn’t take my rants so seriously. I had a bit of a rant last week (surprise!). I’ve lost count of the number of Saturday mornings where I’ve come out of the house and looked down the street to see a line of cars, each with their wing mirrors either hanging off or broken off entirely. So when it happened again last week, and I found myself with my PDA and some time to kill, I wrote an email to my local MP and councillor. It was rambling, it was whingy, and it was a little bit ranty. It was a chance to vent. More constructively though, it was out of curiosity for the sort of response it would get. How politely can a politician say “so what do you expect me to do about it?” 🙂 I am interested in politics, and in the (often overlooked) role that our local policitians have. So I wanted to see what happens when someone actually raises a concern with their local representatives. Eastleigh MP Chris Huhne has been shortlisted for the Opposition Politician of the Year award in the 2007 Channel 4 Political awards. 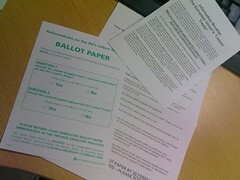 …MPs will soon receive their ballot papers for a secret ballot of all MPs conducted by the Electoral Reform Society. Well done, Chris – and good luck. But, it was the rest of the story that really caught my eye. Make Votes Count is a cross-party campaigning organisation which aims to call for and win a referendum on changing the way we elect Members of Parliament to a more representative system. I am a big supporter of this, and have been a campaigner for Make Votes Count for a couple of years. So, I was interested to find out this evening that Chris Huhne MP has formally taken over as Chair of Make Votes Count. I used to work as a volunteer for Chris – including as a team leader on the campaign team to get him elected as MP last year. I rarely see him nowadays, but I think he’s a good choice and will make a good Chair. Congratulations and good luck, Chris!